When claims from Europe accused British America of being inferior on account of its colder weather, Thomas Jefferson and his fellow Founding Fathers responded with patriotic zeal that their settlement was actually causing the climate to warm. 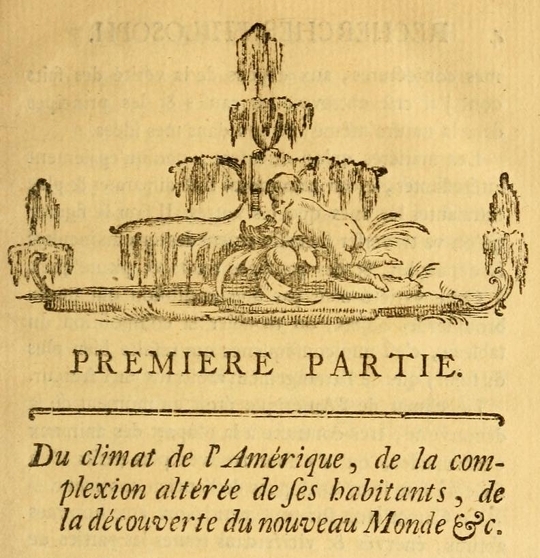 Raphael Calel explores how, in contrast to today’s common association of the U.S. with climate change skepticism, it was a very different story in the 18th century. Portrait of Thomas Jefferson by Rembrandt Peale (1805). Note the furs – Source. The United States has in recent years become a stronghold for climate change skepticism, especially since the country’s declaration in 2001 that it would not participate in the Kyoto Protocol. Nevertheless, though it is a well-documented fact, it might surprise you to learn that, a far cry from the United States’ recent ambivalence with respect to the modern scientific theory of man-made climate change, the country’s founders were keen observers of climatic trends and might even be counted among the first climate change advocates. From the start, the project to colonize North America had proceeded on the understanding that climate followed latitude; so dependent was climate on the angle of the sun to the earth’s surface, it was believed, that the word ‘climate’ was defined in terms of parallels of latitude. New England was expected to be as mild as England, and Virginia as hot as Italy and Spain. Surprised by harsh conditions in the New World, however, a great number of the early settlers did not outlast their first winter in the colonies. Many of the survivors returned to Europe, and in fact, the majority of 17th-century colonies in North America were abandoned. 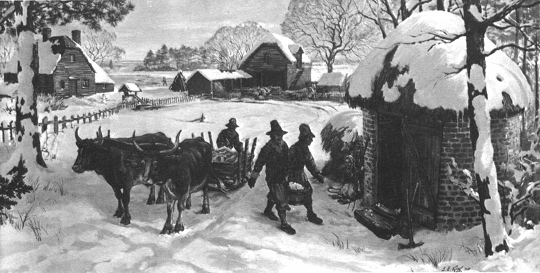 Jamestown colonists endured a severe winter in 1607-1608, black and white copy of a painting by Sidney King for the Colonial National Historical Park – Source. It may not be impossible, then, without inverting the order of nature, that all the animals of the new world originated from the same stock as those of the old; that having been afterwards separated by immense seas or impassable lands, they, in course of time, underwent all the effects of a climate which was new to them, and which must also have had its qualities changed by the very causes which produced its separation; and that they, in consequence, became not only inferior in size, but different in nature. In this edition of Cornelius de Pauw’s Researches Philosophiques sur les Américains, the usual ornamentation preceding the chapter on the American climate is sardonically replaced with this apparently frozen landscape – Source. Men admired as profound philosophers have, in direct terms, attributed to her inhabitants a physical superiority, and have gravely asserted that all animals, and with them the human species, degenerate in America–that even dogs cease to bark after having breathed awhile in our atmosphere. Facts have too long supported these arrogant pretensions of the Europeans. It belongs to us to vindicate the honor of the human race, and to teach that assuming brother, moderation. Union will enable us to do it. Disunion will will add another victim to his triumphs. Let Americans disdain to be the instruments of European greatness! Building on the theories of John Evelyn, John Woodward, Jean-Baptiste Dubos, and David Hume – who all believed that the clearing and cultivation of land in Europe accounted for the temperate climate that had enabled the Enlightenment – the colonists set about arguing that their settlement was causing a gradual increase in temperatures and improvement of the flora and fauna of North America. Hugh Williamson, American politician and a signatory of the Constitutional Convention, believed that “within the last forty or fifty years there has been a very great observable change of climate, that our winters are not so intensely cold, nor our summers so disagreeably warm as they have been,” a fact he attributed to the clearing of forests. “The change of climate which has taken place in North America, has been a matter of constant observation and experience,” wrote Harvard professor Samuel Williams. Benjamin Franklin wrote of the “common Opinion, that the Winters in America are grown milder.” Measurements were as yet inadequate to the task of proving this, he said, but he found the proposed mechanism (i.e. clearing and cultivation) sufficiently persuasive that, even if the winters were not milder already, he could not “but think that in time they may be so.” Benjamin Rush, physician and signatory of the Declaration of Independence, speculated that, if cultivation kept pace with clearing of new lands, climate change might even reduce the incidence of fevers and disease. Thomas Jefferson was especially eager to rebut Buffon and the proponents of the theory of climatic degeneracy. He expended substantial efforts to this effect in his Notes on the State of Virginia (1785), with page after page of animal measurements showing that the American animals were not inferior to their European counterparts. He also had help from James Madison, who shared his own measurements with Jefferson, urging him to use them in his arguments against Buffon. 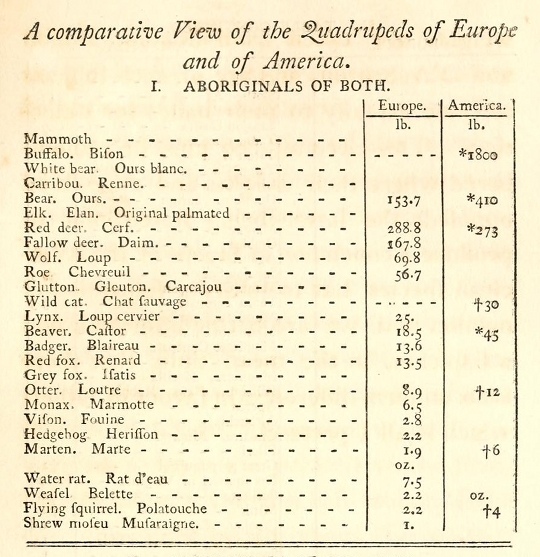 Thomas Jefferson compared the weight of European and American animals, in order to disprove Buffon’s claims that the animals of the New World were smaller degenerate forms of their Old World counterparts. Notice that he includes the Mammoth at the top of his list. – Source. The Founders did not settle for mere advocacy, though. Keen to present as strong a case for climate change as possible, and moderated by their scientific temperament perhaps, they wanted more and better evidence. 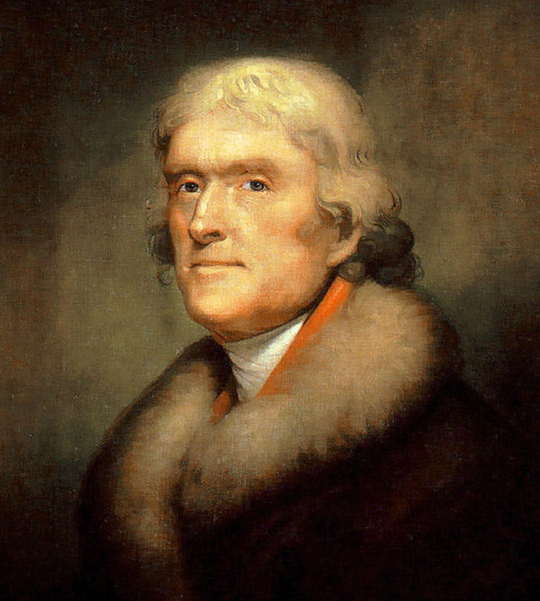 To decide the issue of lions and mammoths, Jefferson instructed Lewis and Clark to pay special attention to “the animals of the country generally, & especially those not known in the U.S. the remains and accounts of any which may [be] deemed rare or extinct.” Although they didn’t find mammoths, they discovered many animals and plants previously unknown to science. On the question of whether the winters were getting milder, Franklin wrote to Ezra Stiles, president of Yale University, encouraging him to make “a regular and steady Course of Observations on a Number of Winters in the different Parts of the Country you mention, to obtain full Satisfaction on the Point.” Madison made regular observations at his estate, which he assiduously entered into his meteorological journals. 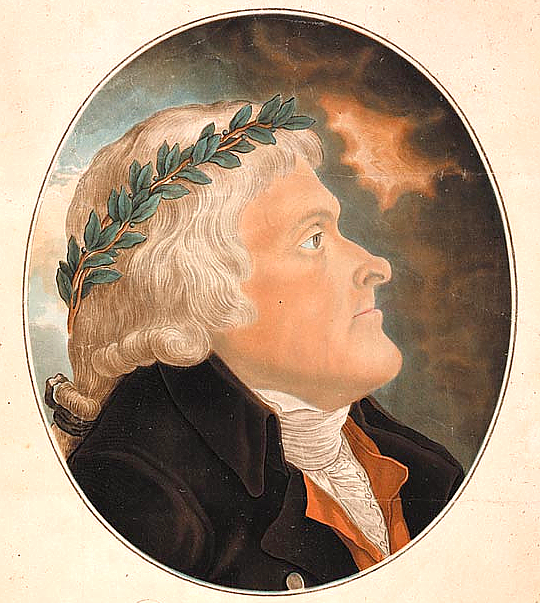 Jefferson, too, kept meticulous records, and encouraged his friends and colleagues to submit their measurements to the American Philosophical Society, “and the work should be repeated once or twice in a century, to show the effect of clearing and culture towards the changes of climate.” Jefferson himself made significant contributions to the development of modern meteorology. In 1778, for instance, Jefferson and the Reverend James Madison, president of The College of William & Mary and cousin of the fourth President of the United States, made the first simultaneous meteorological measurements. Jefferson promoted methodological standardization and expansion of geographical coverage, and was an early proponent of establishing a national meteorological service. 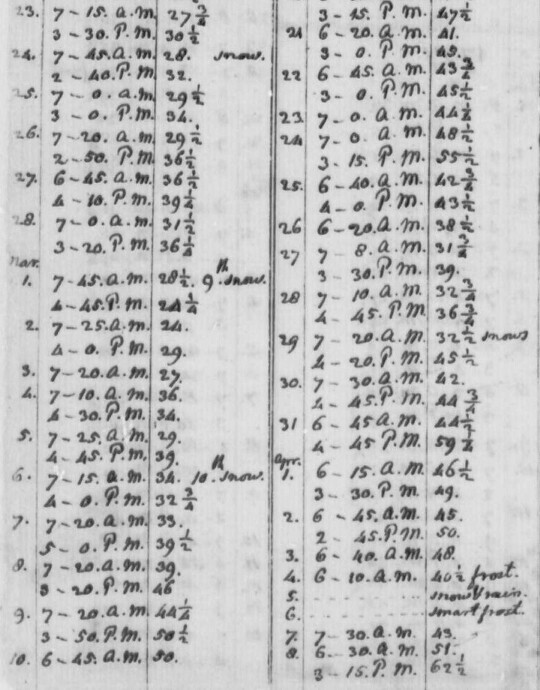 Detail from a page of Thomas Jefferson’s “Weather Record (1776-1818)”, in which he meticulously and somewhat obsessively notes down the temperature on everyday of the year. In this detail, from the year 1777, we see evidence of a particularly cold spring in Virginia, with frost on the ground as late as early April – Source. One need hardly belabor the point that the early climate change advocates were wrong. Modern climate reconstructions show there was a brief warming period in New England during the late 1700s, but Jefferson’s and Williams’ measurements predate any actual man-made climate change. Their theories were pre-scientific in the specific sense that they predate a scientific understanding of the greenhouse effect. It is true that the French scientist Edme Mariotte had, as early as 1681, noticed the greenhouse effect, but it was not until the 1760s and 1770s that the first systematic measurements were made, and it would still be another century before anyone imagined that human activities might influence atmospheric composition to such an extent that the climate might be modified by this mechanism. Their pre-scientific theories also led them to believe that a changing climate would necessarily be beneficial, whereas today we are much more aware of the dangers of climate change. Yet one should not belittle the efforts of these early climate change advocates. Fighting back against the European ‘degeneracy theory’ was necessitated by pride as much as a concern that these ideas might negatively affect immigration and trade from Europe. Their search for evidence, moreover, resulted in substantial contributions to zoology, and was instrumental to the foundation of modern meteorology and climatology. One might speculate, even, that a belief in degeneracy contributed to England’s refusal to afford its North American colonial subjects representation in parliament, and so helped spark the American revolution. In this case, one might construe the Founders’ climate change advocacy partly as an attempt to facilitate a peaceful resolution of their grievances with the Crown. Indeed, so politically important was their advocacy efforts thought at the time that Senator Sam Mitchell of New York, in his eulogy at Thomas Jefferson’s funeral, raised them to the same level as the American revolution itself. Portrait of Thomas Jefferson by his close friend, soldier and part-time painter, Tadeusz Kościuszko (1746-1817). Jefferson’s turn to the hot-coloured break in the clouds perhaps not entirely devoid of symbolism – Source. It is an interesting historical footnote that, during a visit to London, Benjamin Franklin met and became friends with Horace Benedict de Saussure, the Swiss scientist credited with the first systematic measurements of the greenhouse effect. Franklin exchanged letters with Saussure, and encouraged his experiments on electricity. So impressed by Saussure’s work was Jefferson that he would later write to George Washington to suggest recruiting Saussure to a professorship at the University of Virginia, which was then under construction. Far from a stronghold of climate change skepticism, as the United States is sometimes seen today, the country’s founders were vocal proponents of early theories of man-made climate change. They wrote extensively in favor of the theory that settlement was improving the continent’s climate, and their efforts helped to lay the foundation of modern meteorology. Much of the climate change skepticism of the day, on the other hand, was based on the second- and third-hand accounts of travelers, and the skeptics rarely made efforts to further develop the science. In addition, one cannot ignore its political convenience for many in Europe; for instance, Cornelius de Pauw was even hired by the King of Prussia to discourage Prussian citizens from emigrating or investing their capital in the New World. Even if the parallels between the past and present are too obvious to spell out, they can be of some use to us today. While modern climate change advocates and skeptics have become experts at pointing to each other’s errors, we are usually the last to notice our own faults. An episode in our history that bears such strong resemblance to our present provides a rare opportunity to examine ourselves as if through the eyes of another. Today’s climate change advocates may recognize in themselves some of the overzealousness of the Founding Fathers, and therefore better guard against potential fallacies. Skeptics may recognize in themselves the often anti-scientific spirit of the degeneracy-theorists, and hopefully make greater efforts to engage constructively in the scientific enterprise today. One can hope, at least. Buffon’s Natural history, containing a theory of the earth, a general history of man, of the brute creation, and of vegetables, minerals, &c. &c (1797), by Georges Louis Leclerc, Comte de Buffon. A general history of the Americans, of their customs, manners, and colours: an history of the Patagonians, of the Blafards, and white negroes : history of Peru : an history of the manners, customs, &c. of the Chinese and Egyptions (1806), by Cornelius de Pauw. Notes on the state of Virginia (1801), by Thomas Jefferson. See also hyperlinks embedded in the article itself. The Dispute of the New World: The History of a Polemic, 1750-1900 (2010 edition), by Antonello Gerbi – probably offers the most comprehensive chronicling of the debate over the New World. Mr. Jefferson and the Giant Moose: Natural History in Early America (2009), by Lee Dugatkin. Historical Perspectives on Climate Change (2005), by James Fleming.